There were a great many brave men during the Civil War, but I think it is a safe wager that none were braver than Father John B. Bannon. Born on January 29, 1829 in Dublin, Ireland, after he was ordained a priest he was sent in 1853 to Missouri to minister to the large Irish population in Saint Louis. In 1858 he was appointed pastor of St. John’s parish on the west side of the city. Always energetic and determined, he was instrumental in the construction Saint John the Apostle and Evangelist church. Out of his hectic schedule he somehow found time to become a chaplain in the Missouri Volunteer Militia and became friends with many soldiers who, unbeknownst to them all, would soon be called on for something other than peaceful militia drills. In November 1860 he marched with the Washington Blues under the command of Captain Joseph Kelly to defend the state from Jayhawkers from “Bleeding Kansas”. With the outbreak of the Civil War, most of the Saint Louis Irish were strongly Confederate in their sympathies and Father Bannon was of their number. The Irish viewed the conflict in light of their experiences in Ireland with the English invaders, with the Southerners in the role of the Irish and the Northerners as the English. Confederate militia gathered at Camp Jackson after the firing on Fort Sumter, and Father Bannon went there as chaplain of the Washington Blues. Camp Jackson eventually surrendered to Union forces, and Father Bannon was held in Union custody until May 11, 1861. He resumed his parish duties, although he made no secret from the pulpit where his personal sympathies lay. Targeted for arrest by the Union military in Saint Louis, on December 15, 1861, he slipped out of the back door of his rectory, in disguise and wearing a fake beard, as Union troops entered the front door. He made his way to Springfield, Missouri where Confederate forces were gathering, and enlisted in the Patriot Army of Missouri under the colorful General Sterling Price, who would say after the War that Father Bannon was the greatest soldier he ever met. He became a chaplain in the First Missouri Confederate Brigade, and would serve in that capacity until the unit surrendered at Vicksburg on July 4, 1863. He quickly became a legend not only in his brigade, but in the entire army to which it was attached and an inspiration to the soldiers, Catholic and Protestant alike. At the three day battle of Pea Ridge, Arkansas, March 6-8, 1862, he disobeyed orders for chaplains to remain in the rear and joined the soldiers on the firing line, giving human assistance to the wounded, and divine assistance for those beyond human aid. For Catholic soldiers he would give them the Last Rites, and Protestant soldiers, if they wished, he would baptize. At Pea Ridge he first established his reputation for utter fearlessness. He joined a cannon crew after most of the crew had been killed by Union fire. 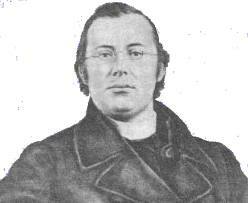 Father Bannon thought that chaplains who obeyed orders and remained out of harm’s way became “frequently objects of derision, always disappearing on the eve of an action, when they would stay behind in some farm house till all was quiet.” In order to do his job of bringing Christ to the men facing death, he reasoned that he had to be with them, and he was quite willing to risk his life doing so. “I am doing God’s work, and He has no use for cowards or skulkers. A Catholic priest must do his duty and never consider the time or place. If I am killed, I am not afraid to meet my fate. I am in God’s keeping. His holy will be done.” Towards the end of the battle he encountered General Earl Van Dorn who ordered him to the rear. He flatly refused to do so, even under threat of arrest, saying that he could not serve at the field hospitals in the rear the men who could not be moved from the battlefield, and that he would not leave, until he had attended them. In the face of such determination, the General retreated. At the siege of Vicksburg he was either in the trenches with the troops or at the hospital helping the wounded. Frequent Union bombardments made life in Vicksburg precarious for all, and Father Bannon had many close calls. He had high praise for the Sister of Mercy nuns who acted as volunteer nurses, for the kindness and skill with which they cared for the wounded soldiers, and their lack of fear while being subjected to bombardments. With the surrender of Vicksburg, Father Bannon’s service as a chaplain came to an end. Although never formally exchanged, Father Bannon, was released by the Union Army, along with most of the Confederate troops captured, after the troops promised not to bear arms until they were exchanged for captured Union troops. Father Bannon traveled to Richmond to report to Bishop John McGill, the Bishop of Richmond. While at Richmond he preached in the cathedral and came to the attention of President Jefferson Davis. On August 30, 1863, Father Bannon was astonished to receive a message asking him to meet with Davis. At the subsequent meeting, Davis asked Father Bannon to undertake a diplomatic mission to Ireland to discourage Union recruiting in that country. At the suggestion of Father Bannon the mission was broadened to include Rome, in hopes that Father Bannon could aid in convincing Pio Nono, Pope Pius IX, to recognize the Confederacy. On October 3, 1863 he slipped through the Union blockade aboard the blockade runner Robert E. Lee, sailing from Wilmington, North Carolina. Father Bannon was first, last and always a priest, and he talked to a sailor, John Bannister Tabb about the Faith during the voyage. Tabb later converted and eventually became a priest. The Robert E. Lee got Father Bannon to Bermuda, and from there he traveled to London, England via Halifax aboard British ships. In London he reported to Henry Hotze, the mastermind behind the Confederate diplomatic effort in Europe during the War. After conferring with Hotze, Father Bannon went to Dublin and went to work writing circulars and drafting posters to be distributed among emigrants sailing to America to dissuade them from enlisting. He painted a dark picture of the North as a land of infidelity and anti-Catholicism and portrayed the South as being invaded by the North just as Ireland had been invaded by England. He also quoted the Pope’s letter to Jefferson Davis in which he prayed for peace in America. There is some evidence that Father Bannon succeeded in convincing some of the Irish emigrants not to enlist, although by this time in the War enthusiasm for enlistment in a bloody conflict that seemed to go on and on was on the wane North and South in any case. That of course does not diminish the incredible amount of hard work and energy that Father Bannon brought to his efforts. In June of 1864 Bishop Lynch of Richmond arrived in Ireland on a diplomatic mission to Rome and, at his request, Father Bannon accompanied him. Father Bannon made a good impression on the Pope, but by this time in the War official recognition was simply not going to happen. In any case, I think no amount of diplomatic recognition, unless followed by military intervention on a huge scale, could have altered the course of the war. While in Rome, Father Bannon decided to entered the Jesuit order. Unwilling to return to the United States after the defeat of the Confederacy, Father Bannon went on to a new life and an illustrious career as a well loved Jesuit priest in Ireland. He died on July 14, 1913. We will end this post with a song which I suspect was a favorite of Father Bannon. Donald: Here is a story I think you’ll like. Thank you Frank! A first rate post!